Just wanted to let you know that the post about DonkeyTest.com has been updated based on feedback from the creator, Lyric Duveyoung. I was watching reruns of the 2008 WSOP Tournaments on ESPN yesterday. As always, announcers Lon McEachern and Norman Chad would periodically mention interesting facts about the players. Two interesting facts about Lyric Duveyoung, an online player, was that he has played over 2 million hands online and that he created a poker IQ test called the Donkey Test. As he explains to ESPN’s Erin Coscarelli in this WSOP Exit interview, it took him a year to write Donkey Test, and at the time of the tournament, his poker IQ test had been taken over 85,000 times. Intrigued, I searched for the Donkey Test on line last night. Found it at DonkeyTest.com. Current number of poker test takers was over 145,000. I took the test and received a score of 98, which classifies me as an Average Player who is “Expected to lose slowly in raked games, break even in homegames”. My “No Limit Texas Hold’em poker life” in a nut shell…How did answering 50 questions reveal that? Did they look up my profile on those websites that syphon data about the No Limit Texas Hold’em tournaments? My Big Pair play is my best skill. My score is better than 85.69% of all persons taking this test. My second best skill is my ability to recognize Betting Patterns. My score is better than 67.96% of all persons taking this test. Next best skill is playing the Blinds. My score is better than 63.06% of all persons taking this test. My least developed skill is Bluffing! My score is better than only a measly 21.19% of all persons taking this test. Here’s the certificate to authenticate that I took the poker IQ test. Unaware that I would not be allowed a ‘do over’, I took the test about an hour before bedtime. I was tired after a long day and impatient to get offline, but I was curious about the questions. Can’t say that I put a lot of thought into many of the questions… and then again, it may not matter. I sure would love it if Lyric and company would create a special ‘Do Over’ database for us curious cats. How about it Lyric? Caution: You can only take the test once, so, do it when you are feeling good and have the time. (<– See comments below.) There are 50 questions, and it takes about 30 minutes to complete. Upon completion, your overall score will display immediately. 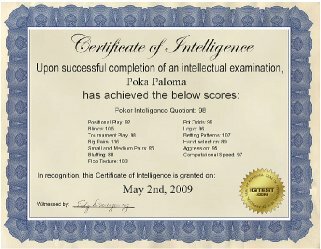 If you want the details of the poker profile created by the test, you need to purchase the profile for $9.95 (as of May 3, 2009). You get the nifty Certificate of Intelligence, too! What about you? Have you taken the test? Do you agree with how you were classified?